Don't make these mistakes on your FAFSA! It was easy for me to complete my FAFSA when I was still in high school and was attending an after school program that helped students get help with getting into a post secondary education. I completed my FAFSA early and had nothing to worry about, but trying to do it on my own after finishing my first year did not go as planned. I applied online like I did the year before and tried to recap all the steps I had done the previous year. I started the application several times and then gave up half way and just kept saying I will do it later. I work 5 days a week and my focus was not on the application, since most days I come home tired. One day though after work and after several reminders from my mom I went on the FAFSA website and filled it out as fast as I could and just sent it in without reviewing it or anything. Thinking I didn't have to deal with it anymore I just kept working and forgot to check back in to see if everything had gone through, a few weeks ago I received two letters saying my application was incomplete and that there was things I was missing or were incorrect. I was in denial once I read the letters, but after reviewing my application I had put the wrong social security in and that is why my application didn't go through. to you the student or the parent is to make sure you go through the application thoroughly so you do not have to get letters in the mail reminding you about your application. Also take your time while filling out the application, there is a save button were you can save your progress and come back if you do not finish. Just keep the words of Aristotle in mind “Well begun is half done”. Thank you Sergio for sharing your experience with the FAFSA. It is important to take your time to understand and fill out the application properly, as a lot of financial aid money is at stake. Good luck to you. Check out our scholarship listings for more ideas for free money for college, including our page on Scholarship Money for College Students and Scholarship Contests . When filling out the FAFSA you might often find yourself confused and wanting to pull your hair out. But with my past experience and hints you should find yourself breezing through your FAFSA Application. When I filled out my FAFSA application as a freshman coming onto college I had no idea what it would look like or all of the materials that I needed to have in order to complete it. I was a first generation child in my family to go to college and had a bit of a struggle completing my application. When I needed help with something I couldn’t ask my parents because didn’t have a clue either. As I sat in front of my computer screen I found myself in a pickle as you could say. Luckily I had some friends that already went through my struggles. They told me tips about the FAFSA that really made a difference in my financial aid for this upcoming year. One big mistake, I mean HUGE mistake that I put on my FAFSA was instead of putting a zero amount where it said income for student I put my mother’s income. From there my financial aid was all messed up. I only received two loans and had to come up with the rest of the money over my freshman year. The stress of worrying where the next thousands of dollars to pay my school often got to me but through the grace of God I made it through. If I had read carefully and made sure that everything was in order I wouldn’t have needed to go what I went thru. Make sure you read everything and triple check everything! You don’t want to make a mistake like I did. You also want to make sure your parents file their taxes before completing the FAFSA. It makes it so much easier when filling it out. I know some parents will say my taxes didn’t come in yet but make sure you stay on top of them. It’s not just you filing out the FAFSA; it’s your parents too. They have a big part in this and you can’t do it alone! Another important tip is to always follow deadlines! FAFSA Deadlines can make or break you so make sure you find out when certain things are due. When completing the FAFSA before March 1, which is the priority deadline for most colleges, you can get way more financial aid as to if you send it in a couple days late. There is also something called Federal Work Study program which helps students earn more money by having a part-time job. By sending your FAFSA before this priority date you can really benefit yourself. Being organized can also save you a lot of the hassle of getting mixed up all the chaos. Make sure you know where everything is so when being asked to show the required information. My last FAFSA tip is that if you don’t know something or aren’t too sure ask for help!! Don’t be afraid of asking the most oblivious question. You want to be more than sure that what you are filling out is the correct information. Now if you take some of these hints into consideration you should have more confidence when completing your FAFSA! Thank you Shannon for sharing your FAFSA hints. Your comment about the mistake you made in listing your mother’s income as the student income is one of the most common mistakes student’s make on the FAFSA Application. It is important to be sure which section is about the student and which is about the parent. Best of luck. Senior year is the most exciting and busy year in the life of a young person. I say this not because I am old, but because I am going through this experience right now. Sending applications to college step 1, taking the ACT/SAT test step 2, sending any additional information step 3. Yes! I have been accepted to blah, blah, blah university, but wait tuition is $28,000, now what? Well on January 1st of every year the FAFSA website is ready to receive your last year’s income tax information or your parents’ income tax information, if you are applicable; you receive money from the government in order to help pay for tuition. What? My parents have not filed their income tax yet, well pressure them early so that by this date it is ready. Early in February 2012, I did not know what FAFSA was neither how it worked. So when I finally sat down in the computer to fill out my FAFSA form, 20 days later I found out that my dad gave me the income tax he filed in 2011. Before I found this out I was the happiest person on earth because I thought I was ready. Then my dad filed his 2011 income tax and I applied for FAFSA all over again, but something very weird happen, FAFSA rejected me. Five days later my dad tells me that someone used my social security card number and claimed me as their daughter so that they would receive money back. This is how I found out why the FAFSA rejected me. 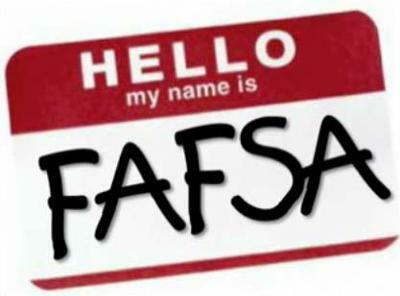 My advice to any high school graduate, any college student who desires to apply for FAFSA to please do it as early as possible and to make sure that the parents have their paper work ready to go so that no inconvenience slows that the process of you receiving financial aid. About me, well I had to call many places, send my information and my dad had to filed his income tax again, but it is all worth it because I have 5,000 dollars to help me pay for college. Read more FAFSA Hints from other students and parents who have been through process. Thank you Diana for sharing your story about how FAFSA rejected you. This is a form of identity theft when someone uses your social security number. This is another good reason to submit your FAFSA early in case there are any unusual reasons why your FAFSA might be rejected. It’s great news that you could resolve this issue and receive your financial aid. Good luck. Read our FAFSA Information - Don't Let FAFSA Reject You! Benjamin Franklin claims "lost time is never found again." When filing for free financial aid through FAFSA, prompt and punctilious actions are essential. The state only has enough funds for students who are in serious need of help, which answers why not everyone is allotted state funding for school. The longer a student waits, the less money will be available, although it is not a first come first served deal. Once you pass the date, the state will have already given out money for other students and you may not receive anything. The future college student must realize that as you gain a real job and more responsibility, less acceptance for late work is allowed. My first time filing for financial aid, I started around late February, which is already two months after you can begin the process, January first of every year. However, I never realized that FAFSA is not completed until you receive the confirmation email that your FAFSA is actually completed. I barely made the May first deadline because I did not file my taxes soon enough which in turn did not allow my to complete my FAFSA early enough. With the extra two weeks needed to review my forms and send a response back, I already had to send in a five hundred dollar check to the school of my choice to make sure I had a spot, even though I was still uncertain of my finances. This down deposit is also necessary for your college wherever you go but it is also a lot of money to waste if you end up not able to go. Luckily, I received financial aid that was in my range but if I had not, then I would not have been able to go to the school that I had already put a lot of non-refundable money into. The best way to deal with FAFSA is to do it as soon as your taxes and any other information are ready. Waiting until the last minute is very stressful and can end up causing loss of money, like the five hundred dollar check that was needed before I got my aid returned. Thank you Seanna for sharing your experience with FAFSA. The best way to receive free financial aid is to submit all items as soon as possible, as you’ve explained, but especially before the FAFSA Deadlines for federal, state and college financial aid. Good luck to you. FAFSA is not the monster it seems and you will agree with me once you have completed the application for the first time. Faced with the unenviable task of deciphering the maze of FAFSA I soon realized one important step: be careful with that TAB key! If there is anything to be gleaned from the FAFSA process, it is the prudent and careful use of the tab key. Its function seems obvious. You quickly tab from one block to another. Little did I know, but in many of those cases I was not joyously moving to the next step, but scrolling between options in the previous window. With a huge sense of accomplishment, I would click on "next" to move to the following page, only to be alerted of an ERROR. Though it is frustrating to have to reenter or correct information, the real demon is the mis-entered data which is not flagged. After carefully completing the form and finally able to press "submit", you later discover that you are no longer married, but single. Your teenage son is divorced and you now have a net worth in excess of one million dollars, thus making the FAFSA form a moot issue. Gird you loins and guard against "mis-tabbing" or else the FAFSA demons will have their revenge.